I’m feeling it…the urge to get stuff done and ready for baby. We decided to have our boys share a room, and even though I still have a few more things to do (like paint Ben’s bed white…and make valances) I’m feeling like its ready for baby. The quilt hanging over the baby’s crib (can you guess his name?) is this one. The quilt on Ben’s bed I made way back here, and its finally out of its storage box and happily on a bed. The big letters came from Joann’s and were spray painted with more Kilz red spray paint from Walmart. It is so nice looking! I have 4 boys and I've stopped decorating their rooms because they just destroy everything. This motivates me to try again! Love it! We're expecting our first boy at the beginning of March. No sharing of space, but it's fun to prepare for him! please come do baby griffith's new room just like this. Very nice! As for the new baby's name, let me take a guess…Riley? absolutely beautiful. You've done an amazing job! i love it! especially the circle garland above their beds…so creative! I guess…Ryan! I gasped at that first picture! So, so perfect! I love all of it. Wonderful! Fun and understated, I love it. We put up a similar looking garland (but made of felt) for our daughter's birthday and I was tempted to leave it up because it was just so happy and cheery (especially during winter). Very cute boys room. As for the baby's name, I'm going with Ryder. I've never had to decorate for a boy. I have FIVE girls. But if I did have a boy, I would want his room to look like this. You go girl! Both room look so cute!! And the quilts are lovely!! Can't wait to hear what the R is for??? Good luck!! I am going with Ryan. I love how you decorated the room. It looks wonderful. The quilts are amazing and the circle garland really adds a special touch to the bedroom. I love it!! I love that the quilts match without being matchy-matchy. Very cute room! Aaaah! Great minds think alike. I just got back from the store picking out grey paint for my boys room. Seeing yours, I am even more excited! Fabulous! Love the room. Way to nest! LOVE it! if you don't mind me asking, what colours did you use on the walls? 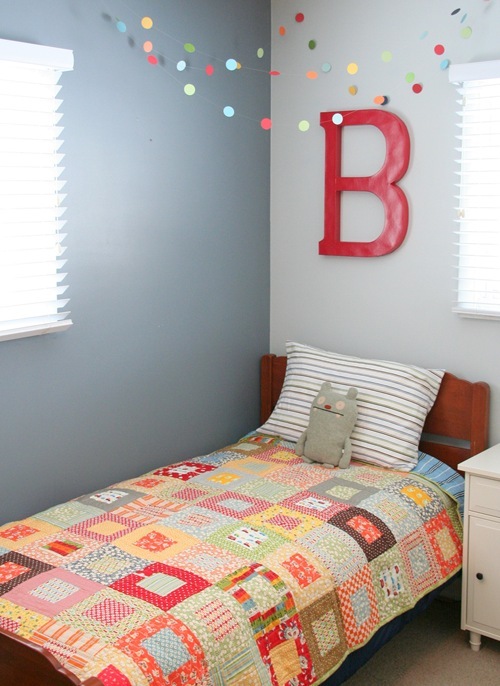 Love the quilts you made and the way they pop with those gray walls! Our master bedroom is the darker shade of gray – it is very relaxing and restful. Just too beautiful! I am going with Rider???? Gasp! Be still my heart! I love the paint… love the garlands… love the splash of the colors… love it all. What a cute room! your little boys will be very happy in here. I love the look. So colorful and fun. Can I just say, I don't know if I would feel good about hanging fishing line over the boys' beds. They are known to jump and tape is known to give out. Seems very dangerous. What a lovely, fun room! I'll go out on a limb and guess Reece. I love that name. I really love it! Totally the look I'm planning on going for in my little boy's room when we move this summer. I even posted on my blog a few days ago about using one of your quilts for inspiration while I plan out a quilt for my son. We're going to most likely be renting, which means lots of white walls, so I was trying to come up with ways to make his room colorful, and I think I'm totally going to steal your dot garland idea!! Thanks for the ideas, I really love your blog! I've never actually finished a quilt before, so wish me luck on my upcoming projects! Robert? Ryan? Roland? Reginald? Raymond??? Ooh, I LOVE that room. Everything about is so fun and modern, perfect for a boys room. You lucked out on the paint colors, they're so cool and the bright colors look really great against it. The garlands are such a whimsical touch too. Great job! A lovely room for a new baby. Your quilts are beautiful. Especially like the circle shapes. You're very good with your creative ideas. Brilliant. I love the room! Your quilts look so wonderful in it. I am novice in sewing and your blog, your projects and your pics are absolutely awesome! You did a great job! I love the colors of both quilts, and am so grateful that you share great tutorials. this is perfection. I have been searching for a quilt design for my son;s room and I have found it. thanks you so much for the tutorial! I can;t wait to make when we pull my son;s room together in a few months. Absolutely amazing! Beautiful room – I love the quilts. The room is beautiful! That blue is perfect, and the quilts are the perfect touch. What lucky little boys. Adorable! I'm going with my son's friend name – Rawlyn (I misspelled it once as Rawlin on his dog tags -oops!) but think it's a great name. My first thought was Riley though. Great job and I have always loved those quilts! My brother's name is Ben and I'm Rossie, so I'm going to guess "Ross." I love the room! 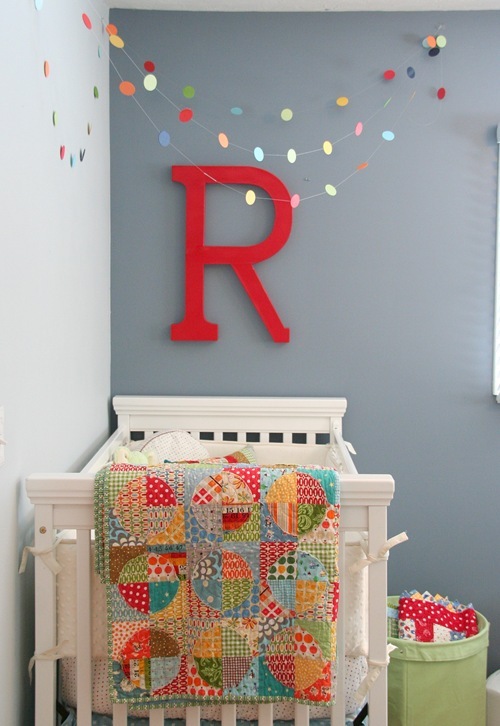 The quilts totally make it, but all the details are great: the dots, the bright red letters! Beautiful! You realized that you're making all us other preggo mommies feel really inadequate! We've got 6 weeks to go and no crib yet, let alone something as well put together as this . . . . sigh. SOOO cute! I love the garlands and the circle quilt! Thanks for the inspiration. The boys room is adorable and you know what- I'd leave the bed the wood color. I think it looks really nice how it is and is a good contrast to the other white in the room. The little red rocker is adorable! Our girls share a room and it really works out well for us. Looks like you are getting settled in the new home. Good to see for you. The room looks simply gorgeous! I love both quilts and especially love how the 'coordinate' Hurray for the nesting urge – hope you're feeling healthy and excited for your new boy! Wow, I really love those colors! And how lucky the walls were a color you loved! I'm dying over the baby/big boy room. Love the colors of your quilt and the hanging circles. Makes we want to get my circle punch out! I am in love with that circle quilt!! Thank you so much for posting a tutorial! Love this kids' room. Those circles are so awesome. And your quilts are fabulous! your boys room is fantastic!! love the line of circles hanging! Really beautiful! I just painted my bedroom gray to get the same effect of bright colors against the cool walls. Simply gorgeous. I am in love! I love the room. I also have a Ben. i think the R might be Ryan? I have a friend who has a son named Rylan. I like it, unique but not crazy. I love your blog and have started my own. It is very new and I have a whole new respect for bloggers- it is not that easy. Thanks for your inspiration and tutorials. Oh my word fabulous. Really. Truly. I am in love. I already LOVE these quilts. Love them. I apsolutly adore the little circles hanging thing. Love it. And those huge letters. Really, do you even know how fabulous you are? you are. I am in love with it all. Hope you don't mind but we have shared with our readers – something about garlands that screams happy and reminded us of the fun of an old-fashioned pyjama party. Wishing your boys sweet dreams, peaceful sleep – and the occasional pillow fight! I LOVE the dot garlands! How creative!!! ADORABLE!! Re-doing our boy's room this year, and love these ideas!! Can I ask if you have a tute on that darling little guy on Ben's bed?! Both mine would LOVE one of those little friends! I'm in love with the garland (and the quilts). We're expecting twins in October, and it's the perfect pop of color for over the baby's cribs. What did you use to attach them to the wall?